A few days later, the bus was on the road. And, One fine morning, saw the bus in close quarters on my way to office. There started the desire to travel by it. A couple of plans were made, but I had to abandon them due to various reasons. After a week or so, I had to head to Kottayam. While searching for ways for my return journey, I came across this vague crazy idea of getting in to the Scania from Dindigul - but I was a bit concerned about the distance and if I'd miss the bus. Some days later, a friend too suggested the same idea - but this time, he gave me reassurance about the distance and time required to reach Dindigul. I decided to give it a shot. After a sumptuous feast at my friend's wedding at a place near Ettumanoor, I rushed back to Kottayam in a KSRTC bus. My only priority was to head out to Kumily in the next bus from Kottayam. Traffic on MC Road was heavy, as usual, and it took about 30 minutes to reach Kottayam. On getting off at the bus station, I headed out to the SM office to find out the timings of the next TT bus to Kumily - the bus was an hour away. I got into the next Limited stop bus from there to Kumily (at 1250hrs). Cutting the story short, the bus dropped me in Kumily at around 1615hrs. After some refreshment, I headed out to the TN side of the town to get a bus to Cumbum. I thought it was my lucky day, as I saw a Puducherry Road Transport Corporation (PRTC) heading out to Pondicherry via Dindigul. I confirmed with the conductor that the bus would drop me in Dindigul by 2130 (he promised an arrival at 2115hrs). I now took a seat in the bus, and reserved a ticket for the KPN Scania using my mobile. I immediately got an SMS from KPN with details of my ticket. I was a bit worried, since they made a fuzz about mTickets during my last journey. I had anyways decided to try my luck with the SMS. The journey by PRTC was uneventful - the driver maintained steady pace most of the time - no harsh driving, or rash overtakes. I was dropped at Dindigul exactly at 2115hrs, as promised by the conductor. I had my dinner, and then wasted some time roaming around. Sometime around 2215hrs, I got an SMS from KPN with the registration number of my bus, and the departure time from Dindigul. The message said that the bus is at 2300hrs - while my ticket said 2345hrs! I did not want to take a risk - so hired an auto from the bus station, and headed out to "Palani Bypass". Most of the long buses do not enter the town for pick-ups, but stop at the bypass. I was at the KPN "office" by around 2245hrs. I cannot really call it an office - it basically a room, with three benches put near the walls. Half the room was used for dumping some stuff, and the roof was lined by cobwebs. The benches were clean though. No staff were present in the office - but lights and fan was on. One guy was sitting outside the office on a bike (later understood that this guy dispatches buses from there). I badly needed to recharge my phone's battery - so plugged it to the sole power plug in the room and let it charge. Since I needed to stand guard for the phone, I plugged in my headphone as well, and listened to some songs. While waiting there, a Volvo and an AC Sleeper to Bangalore came. The AC sleeper had a tyre puncture - so it remained there for about 20 minutes while the crew changed the tyre. The clock ticked past 2345hrs, and there was no sign of my bus. One passenger in the office was heard saying that this is regular - the bus comes only by 0000hrs, but they send out a message with 2300hrs timing every time. I was quite surprised - why should they do that? The road outside was busy all the while - a lot of buses, mostly bound to Chennai, went past. After 2355hrs, I got tired sitting inside the office - the phone was fully charged now. I took it off charging, and stood outside the office now. As I walked out of the office, saw this boxy vehicle with low headlights coming in - I jumped up in joy, rushed back to the office and pickup up my bag. In the meantime, the bus rolled in - it was 2359hrs. I was so excited that I literally waited for the door to open and jump into the bus. The door was designed to swing out - at first it looked a bit odd to me - but the fact that it frees up a lot of cabin space left me impressed. The cabin was well lit and spacious. I just walked in - just then the dispatcher called me asking my ticket. I showed him the SMS - he wrote down the PIN number from that message on the Boarding chart, while the attendant pointed out where my seat would be. I had taken a right side window seat on the 8th row of the bus. The gangway was as wide as the Volvo - not the narrow design like the Mercedes. The interior lighting was great. I reached my seat - had to disturb the elderly gentleman on the aisle seat to reach my seat. The AC was very chilling. The seat was very comfortable - the curves felt perfect. I was quite sleepy already. The bus started off at 0003hrs, with an ear-piercing whistling sound from the engine. I was a bit shocked hearing that kinda noise. The engine was noisy till it upshifted to 4th gear. The OptiCruise system felt smoother than the iShift - the transmission shifted at perfect levels keeping the rpms under control. The bus picked pace quite rapidly - the 410hp engine was effortlessly pushing us forward. The attendant came around distributing blankets. The lights were switched off - only the night lamps were on now. Unlike in the Volvo, the night lamps in the Scania were fixed on the rooftop hatches - so the light was concentrated at two places in the bus. This meant good news for passengers away from the hatches. The overhead console. One needs to turn the ornamental ring around the air vents to shut it. The quality of the console was great. A while later, I felt the AC was quite chilling - I played around with the AC vents trying to shut it - but couldn't figure out how. 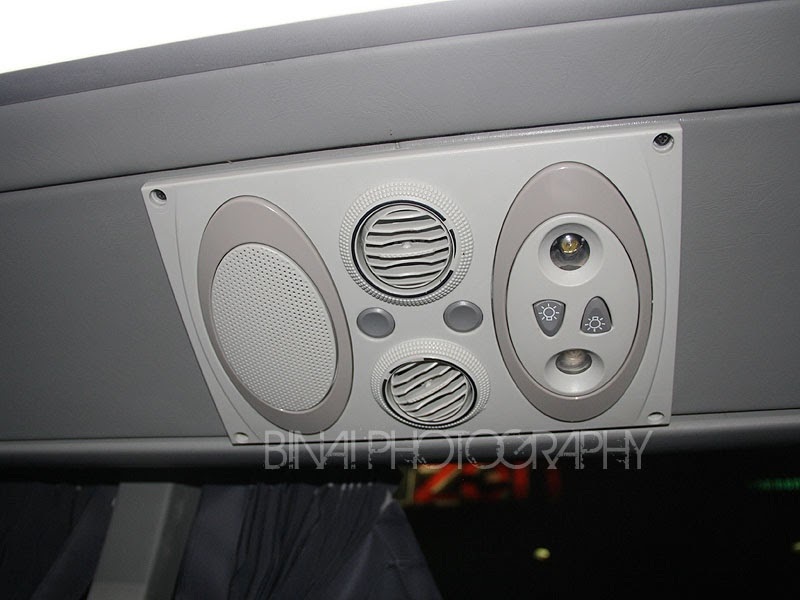 The range of the vents were too limited - the material looked good though. The tiredness got the better of me, and I fell asleep soon. I did not realise anything outside - woke up by the commotion of people pushing in luggage on to the overhead racks - it was around 0225hrs - and we were in Salem. We started off at 0229hrs. I slept off again. Another round of continuous sleep. I woke up around 0540 or so - we were starting off from Attibele toll gate then. I decided to get up now. We stopped at Electronic City, at 0551hrs. After starting off from there, I got off the seat and headed to the first row. As I reached there, the attendant enquired about my drop-off point. When I told Bommanahalli, he requested me to remain seated. Now the main lights were, but blue lamps were on - this was bright enough to walk without stumbling anywhere, but not very bright to disturb people sleeping. The cabin was very spacious, and there were handles at the right places. The bus had very little horizontal sways (or body roll). It did not push me around when the driver stopped or started from traffic lights. The braking was very confident - the retarders did a very good job, but were a bit noisy. I had a short chat with the driver - he was on his first trip in the Scania, and was thrilled driving the beast. He was worried only about the length, and was happy about everything else. He pulled to the side at Bommanahalli - to drop me. The watch read 0559. The beast pulled away even before I crossed the service road to reach the auto stand. End remarks: The bus was KA-51-B-9992. She had recorded some 16000kms on the odo. 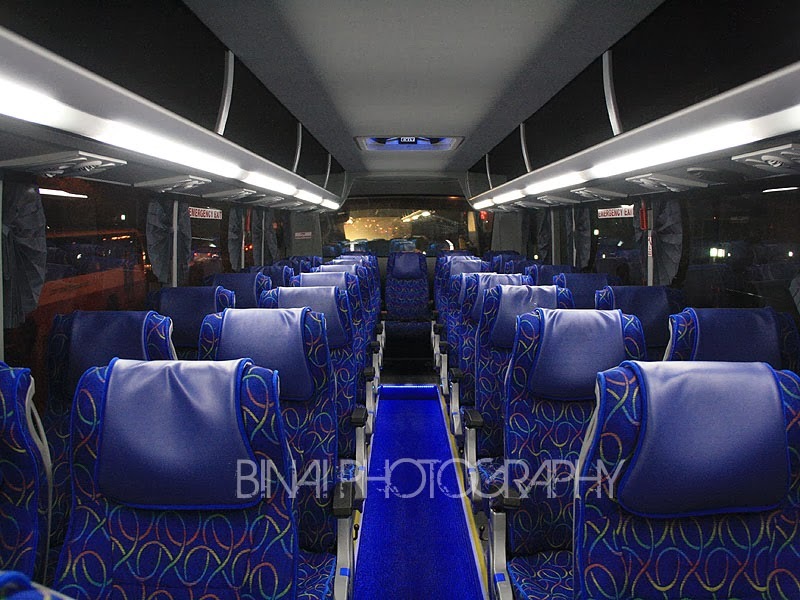 This bus had the best interior finish I had seen till date. The overhead rack was deep and tall - putting a bag into the rack was quite easy, and one needn't be scared if it bounces out when the driver jumps on the brake. The retarders ensured that I was on my seat when the driver pumps the brakes. The ride quality was very matured - it did not sway around like a cradle. I was comfortable even when standing in the cabin - it did not push me around like a Volvo. The out-swing door meant that I could walk out of the cabin and not squeeze myself out (with the attendant standing there). The seats were great - on par with the Volvo. The bus was dead silent when stand-still - but very noisy in the first three gears. It was on par with competition beyond third gear. The AC vents needed some playing around - but I was quite impressed when I learnt how to shut it. But I felt the range of direction adjustment needs to be increased. The window sills were quite tall - its higher than the handrests - so one can actually rest on the window sills than the handrest. The window sill was wider as well. It is definitely a better package that what is currently available in the market. The ride quality was matured and the interiors were top notch. Maintenance: Irrelevant to comment on. Its a new bus! Will I take the service again? This trip was to test the bus. But the service is surely a great option. It'll be interesting to see KaSRTC's reaction to Scania introduction - with both Volvo and Scania based in KA, have to wait and see if they'll start splitting orders or show a preference for one of the two.. Your blogs are fantastic and though I've never travelled in a Volvo in India, I dont feel like I've missed anything! 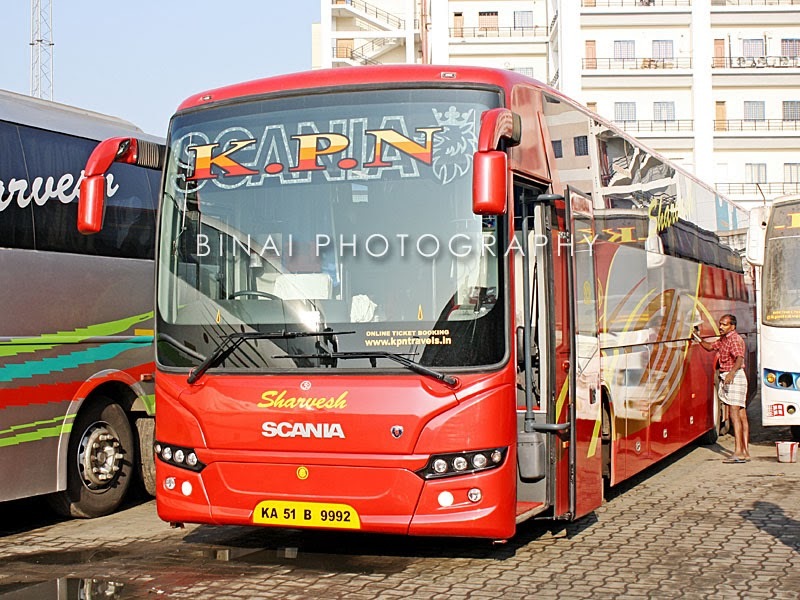 We represent Scania India and we would be more than happy to connect with you. Please advise us on how we could go about that since we couldn't find any information here.